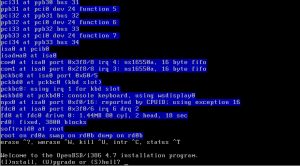 This ISO image will contain all installation sets and will not require an internet connection when installing OpenBSD. Start the installation by booting up using the installation disc. 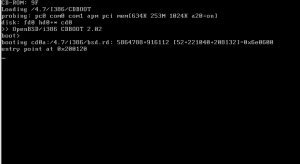 The system will display a 'boot:' prompt. Hit enter to boot the system or just wait a few seconds. Press "i" then hit enter for OpenBSD installation. Hit enter for default keyboard layout. Type your hostname and hit enter. Hit enter to configure em0 network interface. Hit enter for dhcp or insert the IP address. 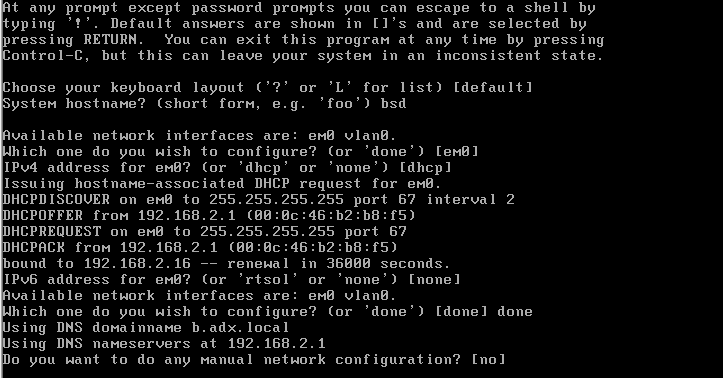 Hit enter to start ssh when the sistem starts. Type n and hit enter if you don't need X Window System. Otherwise just hit enter. Hit enter for default console. Hit enter to skip creating a user because we don't need a user at this point. Press '?' for list. Type your timezone and hit enter. Hit enter to use the whole disk. Hit enter to use auto layout or c to create custom layout. We'll use auto layout. Hit enter for 'cd' because we are using the cd installation. Hit enter for default which is cd0. Hit enter for default ( we are using i386 install cd ). Type -x* to deselect X Window Sets and hit enter. Type -game* to deselect games and hit enter. Hit enter to install sets. Now you'll see a "CONGRATULATIONS! 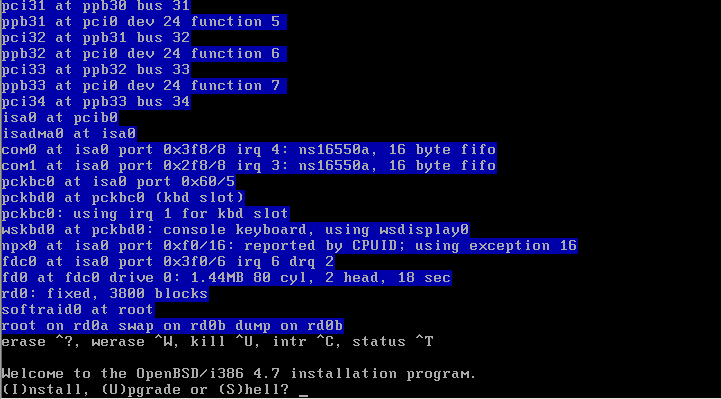 Your OpenBSD install has been successfully completed!" 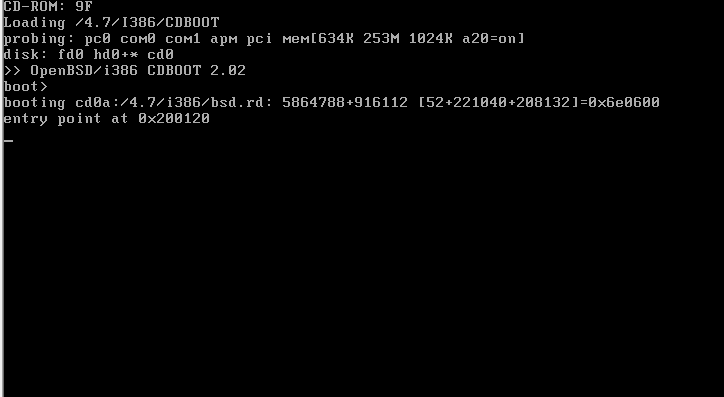 Just type 'reboot' at the prompt and remove the CD.Then, press a key to reboot. 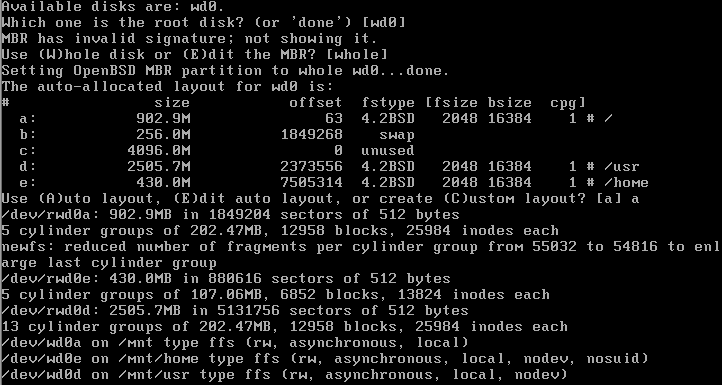 NOTE: Remember to use 'man afterboot' to read about how to configure your new OpenBSD system. That's what an army is -- a mob; they don't fight with courage that's born in them, but with courage that's borrowed from their mass, and from their officers.